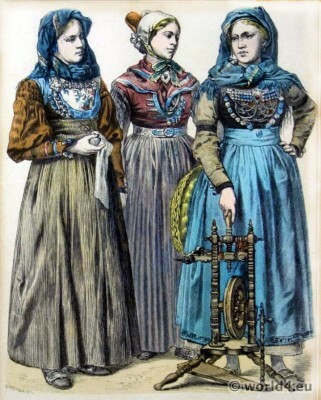 Friesland Costumes 1860. 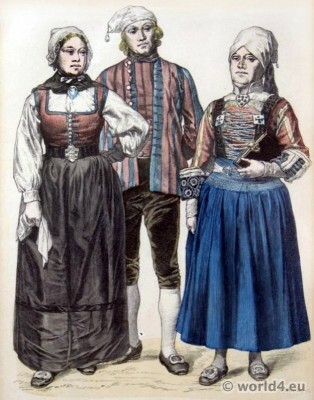 Peasants of Biölkaspel, Foehr, Osterfeld. Home » Friesland Costumes 1860. Peasants of Biölkaspel, Foehr, Osterfeld. Peasant Girl and Farmer from Biölkaspel. Peasant woman from Osterfeld. About 1860. Source: On the history of costumes. From Ancient to the 19th century. Münchner Bilderbogen. Zur Geschichte der Kostüme. This entry was posted in 1860, 19th Century, Germany, Netherlands, Traditional and tagged Münchener Bilderbogen, Traditional German Costumes, Traditional netherlands costumes on 9/8/14 by world4.